This is a rare antique piece of Coca-Cola merchandise. 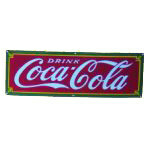 It features the simple logo “Coca-Cola” in the display area. The rectangle upon which the logo is printed is red with white text. The metal base has the message “Please Pay When Served” in white letters on a red field. The sign has a decorative metal topper.